Convection flows are one of the fundamental problems in fluid dynamics. They play a decisive role in meteorology where they appear as wind caused by solar radiation in the atmosphere. Moreover, they are important in industrial applications, where they are used, to mention just one example, in cooling systems to reduce possible noise exposures and technical failures. Although many theoretical, experimental and numerical investigations have been performed in the past, these flows are not quite understood and they are still of substantial interest. The main focus of this paper lies on a Large-Eddy simulation (LES) of the effective lift due to the occurred convection and the following thermal mixing of the flow. Therefore, a rectangular air-filled container with plane walls is chosen as computational geometry. The vertical side walls of the container are heated isothermally with a constant temperature difference The computational test case is chosen analogously to a comparable experimental test case of Tian and Karayiannis in  . To investigate the natural convection in the simulation, the computational test case is built of a rectangular, air-filled, enclosed container, with a length (L) of 0.75 m, a height (H) of 0.75 m and a depth (D) of 1.5 m. A scheme of the computational test case is displayed in Figure 1, left picture. where is the wall shear rate, the kinematic viscosity and dynamic viscosity. marks the velocity gradient directly at the wall. Table 1 lists values of estimated in the first cell midpoint in the full turbulent flow for both simulation types and both temperature boundary conditions. The different values between the simulation types are caused by different velocities close to the heated walls. Figure 1. Left: Configuration of the computational test case. Right: Computational mesh resolution with cells. Table 1. Temperature boundary conditions and values of the non-dimensional wall distance y+.
. The time-averaged results of the 3D and 2D simulation are plotted against the experimental data of Tian and Karayiannis  in Figure 3. Figure 2. Instantaneous temperature (left) and vertical velocity (right) profile between the heated walls, linear temperature condition. Figure 3. Time-averaged temperature profile at the vertical xy-midplane along the horizontal axis, at x = 0.75 m, z = 0.75 m and different heights. Top: Adiabatic bc. Bottom: Linear bc. Detailed plot of the hot/cold wall. In all pictures: y1 = 0.1H (blue), y2 = 0.5H (red) and y3 = 0.9H (black), − (solid line): 3D, − − − (dashed line): 2D. study Tian and Karayiannis  , Ra = 1.58 × 109.
circulation zones compared to the experiment. The 2D plot shows only slight deviations to the 3D plot. The linear results approximate the experimental data closer than the adiabatic results, due to the similar boundary condition. The results of the 2D-simulation lie even closer to the experimental data than the results of the 3D simulation. Figure 4. Time-averaged profile of the local Nusselt number along the heated walls. Top: Adiabatic bc. Bottom: Linear bc. Left: 3D simulation. Right: 2D simulation. In each picture: − (red solid line): hot wall, − − − (blue dashed line): cold wall. Study Tian and Karayiannis  : ●: hot wall, cold wall, Ra = 1.58 × 109. 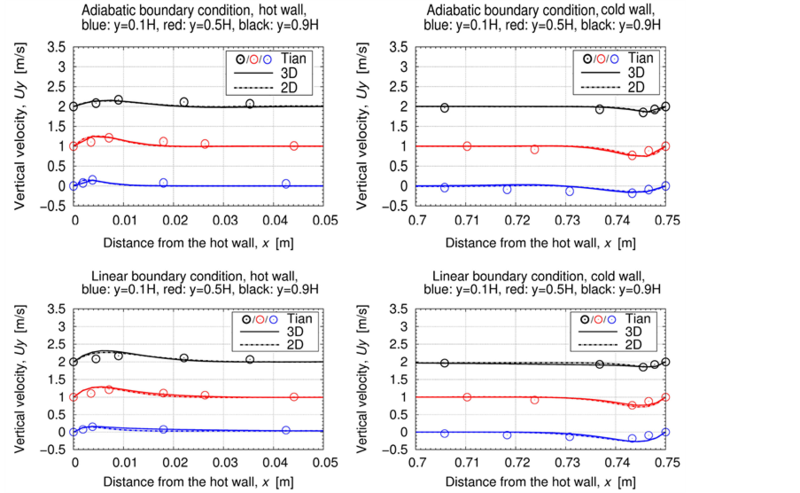 Study Mergui, Penot and Tuhault  : ∎ : hot wall, □ : cold wall, Ra = 1.34 × 109. 3D case are slightly lower at the hot wall than at the cold one. But the values at midheight deviate in both simulations significantly from the data in  , of about at most 20%. This might possibly be caused by lower temperature gradients. The numerical data approximate well the numerical study of Mergui, Penot and Tuhault  . As in the temperature profile, a clockwise circulation direction and an increase of the boundary layer along the heated walls in flow direction are visible. The boundary layer reaches its maximum width at the hot wall at height (respectively at the cold wall at height ). The thermal boundary layer is smaller than the velocity boundary layer. As in  , negative values appear between the inner and outer layer of the profile in the simulation results which indicate possibly a reverse flow. The vertical velocity component reveals at every height high peak values close to the vertical, heated walls. Minor decreases with negative values can be noticed outside the boundary layer at the hot wall (vice versa at the cold wall). According to  , this decrease/ increase might indicate two further possible clockwise circulation zones. The adiabatic profile shows a slightly smaller boundary layer than in the experiment, as it was expected. The peak values are located closer to the heated walls and lie beneath the experimental ones. No significant differences arise between the 2D and 3D simulation results. The profiles of the linear boundary case approximate well the results of  . Due to the different temperature conditions at the horizontal walls between the simulation and experiment of  , the peak values of the 3D and 2D simulation are higher than in the experimental study. Figure 5. Time-averaged vertical velocity profile at the xy-midplane, at x = 0.75 m, z = 0.75 m and different heights. Top: Adiabatic bc. Bottom: Linear bc. Detailed plot of the hot/cold wall. In all pictures: y1 = 0.1H (blue), y2 = 0.5H (red) and y3 = 0.9H (black), − (solid line): 3D, − − − (dashed line): 2D. study Tian and Karayiannis  , Ra = 1.58 × 109.
with the gradient of the vertical velocity component directly at the heated walls (index w) and a depending dynamic viscosity . Besides the experimental data of  also another experimental study of King  is compared to the numerical data of this study in Figure 6. As Figure 6 shows, the time-averaged shear stress rises, analogously to the velocity, along the vertical, heated walls to its peak value and back to zero in the corners. The results of  reveal an asymmetry in the corner regions. The data of King  reveals higher values than in the study of Tian and Karayiannis  , which are possibly caused by a higher investigated Rayleigh number of King  according to  . The simulation profiles show an asymmetrical form, which is founded in the asymmetrical velocity profile. All simulations reveal negative values in the top hot and bottom cold corner which indicate anti-clockwise vortex regions as mentioned in  . The values along the heated walls in this study are higher than the data of  , due to higher velocity gradients and higher dynamic viscosity values. The high values of this study approximate rather the data of King  than of Tian and Karayiannis  . Figure 6. Time-averaged wall shear stress profile along the heated walls. Top: Adiabatic bc. Bottom: Linear bc. Left: 3D simulation. Right: 2D simulation. In all pictures: − (red solid line): hot wall, − (blue solid line): cold wall. Study Tian and Karayiannis  : hot wall, cold wall, Ra = 1.58 × 109. Study King  : ♦: hot wall, ◊: cold wall, Ra = 4.5 × 109. 2-dimensional simulations were executed to investigate possible grid dependencies. Taking the different boundary conditions and the non-Boussinesq fluid assumption of the computational study into consideration, the results of the investigated fluid properties in all 3-dimensional simulations approximated well the experimental results of  . The simulation data showed the same profile tendencies as in the experiment  . The results of the 2- and 3-dimensional simulations revealed in most cases similar results and only small deviations to each other which appeared mainly in vicinity to the heated walls. These deviations have to be further investigated in future studies to find an additional explanation as the one of grid dependencies. Summarising, the presented LES is very qualified to model the flow structures and fluid properties profiles of a turbulent, natural convection flow in the investigated configuration of a rectangular container where the vertical walls are heated. The authors wish to thank the North-German Supercomputing Alliance (HLRN) for providing their hardware during the numerical simulations of this study.